The Federal Reserve Bank of New York is the largest gold custodian in the world. The Bank claims to store more than 5,800 tonnes of gold on behalf of 36 foreign central banks, foreign governments and international financial organisations, as well as a small percentage of the US Treasury’s gold holdings. 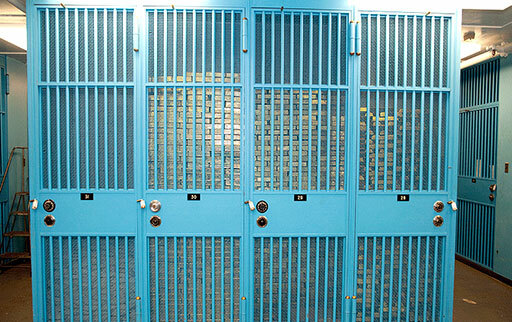 The storage arrangements for the gold in official custody make use of 2 vaults underneath the New York Fed’s headquarters building in Lower Manhattan, New York. The ‘Main’ vault open in 1924. The second vault, known as the ‘Auxiliary’ vault, opened in 1963. 8. How much gold at the FRBNY, historically and currently? 9. Who owns the gold in custody at the NY Fed? The New York Fed, also known as the Federal Reserve Bank of New York (FRBNY), is one of the 12 regional Federal Reserve Banks that, along with the Federal Reserve Board in Washington DC, make up the Federal Reserve System. Like all the regional banks in the Federal Reserve System, the New York fed is privately owned. To illustrate, a New York Fed executive, Dino Kos, in a 2004 interview, described the 12 regional fed banks as “basically private entities with a special set of customers“. However, the New York Fed is by far the most important of the 12 regional Fed banks since, apart from storing the gold, it has responsibility for the Fed’s international operations and its owners include the powerful New York based money-center banks such as JP Morgan Chase, and Citibank. The main gold vault of the New York Fed is located in the lowest level of a three-tier vault structure built into the very deep basement of the Federal Reserve Bank of New York headquarters building at 33 Liberty Street in the historical financial district of Lower Manhattan. This basement is referred to as basement E or the basement on the 5th sub-level. The FRBNY headquarters building occupies an entire city block in Manhattan, bordered by Liberty Street, William Street, Maiden Lane and Nassau Street. Maiden Lane runs north of the building, William Street to the east, Liberty Street to the south, and Nassau Street to the west. The FRBNY publishes a limited amount of official information about its gold storage vaults. Most recently, this consists of one web page on the New York fed website with selected high-level data about the main gold vault. Most of the information on that web page has been taken from previous editions of official New York Fed educational booklets about the fed gold vaults which were originally published in the early 1970s and have gone through a number of iterations via subsequent editions. The trend has been that the information communicated by the NY Fed about the vaults has become less revealing through the various iterations, and therefore, early editions contain the most informative information. The Fed’s first educational booklet is called “Key to the Gold Vault”. The first edition of this publication in 1973 was written by the New York Fed’s in-house financial staff writer, Charles Parnow. Four versions of this booklet are accessible online in various archives, the 1991 version, the 1998 version, the 2004 version, and the 2008 version. Another educational booklet titled ‘A Day at the Fed’, also written by Charles Parnow, and also first published in 1973, has some in-depth coverage of the New York Fed gold vaults. A 1991 version of this publication is accessible online. An in-depth analysis of the gold vault details found in these booklets can be read in BullionStar blog “The Keys to the Gold Vaults at the New York Fed – Part 1“. In October 2012, the National Geographic Channel produced a TV documentary titled “Inside America’s Money Vault”. A synopsis of the program is described on the National Geographic website. The “Inside America’s Money Vault” documentary can be viewed here. The segment on the gold vault is 8 minutes long and runs from 1:30 minutes to 9:16 minutes at the above link. Notably, the auxiliary vault is not covered and is not even mentioned in the National Geographic documentary. “the construction of the foundation is considered to be one of the most difficult and exacting pieces of foundation engineering ever undertaken”. When the basement excavation was complete, the triple-tired vault was lowered into place. Originally, the Fed stored securities in the vault on level C, currency in the vault on level D, and as is still the case now, gold bars and coins in the lowest vault in basement level E.
The three levels of the vault structure are known as basement levels C, D and E. The main gold vault, located at Basement E level, is approximately half the length of a football field. The main gold vault entrance does not use a standard vault door. Instead, the vault entrance is secured by a 90 tonne steel cylinder that rotates within a steel and concrete surround which itself weighs 140 tonnes. The cylinder rotates 90 degrees to provide access to the passageway, and can rotate back to fully seal the entrance. A four-foot wide corridor runs all the way around the vault, with the outer walls of the corridor being the actual perimeter of the basement hull. Both the vault walls and the outer walls of the corridor are lined with reinforced concrete, and so the vault has on occasion been called a ‘double-vault’. The interior of the gold vault comprises 122 compartments, or cages, that each hold gold bars on behalf of an individual country. There is also a library compartment which stores gold on different shelves belonging to a number of foreign central banks that do not have enough gold in custody to justify use of an individual compartment. Old news reports from 1960 state that there were 96 compartments, so it appears that over time, some of the existing compartments have been sub-divided. The New York fed communications team confirmed in 2015 that “the auxiliary vault is a vault located near the main gold vault; hence it’s referred to as an auxiliary vault,” but beyond that they declined to elaborate. Elsewhere, the vault door of the auxiliary vault has been said to weigh 30 tons. The lost likely location for the New York Fed’s auxiliary vault is basement B5 at 1 Chase Manhattan Plaza. One Chase Manhattan Plaza (1 CMP) is a large building adjacent to 33 Liberty Street which was completed in the early 1960s by Chase and is now occupied by JP Morgan Chase. It takes up a 2 block site and is bordered by Nassau, William, Liberty, and Pine Streets. The 1 CMP bulding also has a massive precious metals vault in its basement, at the same depth (the 5th sub-level) as the New York Fed’s main gold vault. These 2 vaults are literally adjacent to each other under the street each side of Liberty Street. Since the Fed auxiliary vault was opened in 1963, this date fits in with the opening of 1 Chase Manhattan Plaza, and it is probable that the Fed’s auxiliary vault was either built and installed at the same time as the Chase Plaza vault, or alternatively is actually part of the Chase vault structure. If this is the case, then there would most likely be a tunnel or link corridor between the 2 vault complexes. The vault under Chase Manhattan Plaza, now used by JP Morgan, weighs 985 tonnes and has 6 huge doors, weighing a combined 250 tonnes. The vault is 350 feet in length, 100 feet wide (35,000 sq feet of floor space) and is over 8 feet in height. Concrete walls seven feet thick surround the vault. This vault is also authorised by COMEX as an Approved Facility for the storage of gold, silver, platinum and palladium in relation to COMEX precious metals futures contracts. See BullionStar blog “The Keys to the Gold Vaults at the New York Fed – Part 2: The Auxiliary Vault” for full analysis of the auxiliary vault. How much gold at the FRBNY, historically and currently? Since the 1970s, there has been a continuous slide in the quantity of gold bars held at the New York Fed on behalf of foreign central banks and governments, and also a reduction in the number of central bank / government clients represnted. In 1963, the main gold vault held 13,000 tonnes of gold in the form of 960,000 bars on behalf of 70 customers. In 1978, the customer list had grown to 85 individual countries represented. By the late 1990s, the Fed reported that there were 60 customers. By 2008, this figure had fallen to 36 central banks, governments and international institutions. So between 1978 and 2008, there was a staggering reduction in the customer base, with 50 less customers/countries represented in 2008 compared to 1978. The majority of the gold stored in the fed’s New York vaults is in the form of US Assay office gold bars. These are the ‘brick’ shaped bars that can be neatly stacked on top of each other. The reason the New York vaults are full of these US Assay Office bars is that most gold held by foreign central banks was purchased from the US Treasury, and this is the gold that the US Treasury supplied when central banks converted their US dollars into gold bars during these transactions. During the Bretton Woods era from the 1940s – 1960s, the Fed and Treasury also had a policy of re-smelting foreign gold shipped received in New York into US Assay Office bars before storing it. In 1991, the vaults held approximately 315 million troy ounces of gold. In 1997, the holdings had fallen to 269 million ounces. By 2004, there had been a further reduction to 226 million troy ounces. As of early 2008, the Fed claimed to have 216 million troy ounces under custody. As of 2012, the vaults held 212 million ounces, in the form of 530,000 gold bars, weighing approximately 6,700 tonnes. As of 2016, the Fed reports foreign gold custody holdings of just under 6,000 tonnes. The Federal Reserve Board reports its foreign gold holdings each month in its ‘International Summary Statistics”, in a line item on the ‘page 2 tab’ titled “Earmarked Gold”, . Note that the line item ‘Gold Stock’ on the page 1 tab refers to the US Treasury’s gold holdings and not foreign custody gold. Both ‘Earmarked Gold’ and ‘Gold Stock’ are valued in the report at the historic $42.22 per fine troy ounce. Who owns the gold in custody at the NY Fed? The FRBNY does not comment on the identities of its foreign central bank, foreign government or international institution gold holders, or how much gold these types of customers hold, however, some of these individual central banks and institutions do comment or report their gold holdings to a general degree. The only information the FRBNY reveals is that (as of 2008) there were 36 foreign gold customers. Unlike other major central banks such as the Bank of England, Banque de France and Banca d’Italia, the Federal Reserve Bank of New York holds very little of the gold belonging to its Sovereign gold holder (i.e. the US Treasury). The New York Fed does claim to hold 13.45 million ounces of gold on behalf of the US Treasury, but this is less than 4% of the 261.5 million ounces of gold which the US Treasury claims to hold. The detailed weight lists (custodial inventory) of the US Treasury gold held at the FRBNY can be seen in a 2011 US Congress document, beginning on page 128. According to that custodial inventory statement, 31,204 gold bars are stored in 11 compartments (listed as compartments A – K) in the New York Fed’s gold vaults. The probable largest foreign gold holder at the New York Fed gold vaults is the International Monetary Fund, with an estimated holding still in excess of 2,000 tonnes. The next largest gold holder would be the Deutsche Bundesbank, which at the end of 2015 reported that it held 1,347.4 tonnes in the New York vaults. After this, the Banca d’Italia says that it holds a substantial amount of gold in New York, estimated to be over 1,000 tonnes. The Dutch central bank, De Nederlandsche Bank, holds 190 tonnes of its gold with the New York Fed. In total, the IMF, Bundesbank, Banca d’Italia and De Nederlandsche Bank officially could hold more than 4,700 tonnes of gold in New York, which would account for approximately 80% of the total gold held in the FRBNY vaults. As to whether all of this gold is actually in the main and auxiliary vaults is another matter entirely. The Federal Reserve Bank of New York is one of the 4 designated gold depositories of the International Monetary Fund, the other 3 being the Bank of England, the Banque de France and the Reserve Bank of India in Nagpur. In 1976, the last time the IMF officially reported the breakdown of where its gold reserves were stored, it held 107 million ounces, approximately 3,300 tonnes of gold (70%) in New York, 29 million ounces (19%) in London, 12.5 million ounces (8%) in Paris and 4.6 million ounces (3%). Over 1976 – 1979, the IMF sold 50 million ounces of its gold holdings, 25 million ounces via auctions and 25 million ounces via distributions to members. At least 1,000 tonnes of these auctions/distributions were from New York, which would leave over 2,000 tonnes of gold still at in the New York vaults, assuming that the 2010-2011 IMF on market and off market gold sales were sourced from non-US stock. This is probably the case given that India purchased 200 tonnes from the IMF and India has no gold held in New York, and also because the on-market sales would have used London Good Delivery Gold, and the IMF does not hold Good delivery Gold in New York, only melts. The IMF gold bars held with the New York Fed are primarily in the form of US Assay Office ‘melts’, which are batches of 18 – 22 bars which were originally cast at the same time, and are stamped with the same melt number and gold purity, and weight-listed as one unit. Since 2013, the Deutsche Bundesbank has been engaged in a comical go-slow gold repatriation program of a portion of its gold holdings from the FRBNY and the Banque de France. The Bundesbank already claims to have brought back 189 tonnes of gold from New York to Frankfurt between 2013 – 2015, leaving 1,347.4 tonnes of its gold still in New York, and with a plan to transfer a further 111 tonnes from New York to Frankfurt by 2020. Given that the Bundesbank could easily transport back 300 tonnes of gold from New York to Frankfurt in a year, the multi-year nature of this program implies that the Bundesbank gold is either not actually in the Fed vaults or else has been leased or transferred ownership in some way. Banca d’Italia is a very large holder of gold at the New York Fed and says that the bulk of its more than 1,200 tonnes of gold stored abroad is stored at the Federal Reserve Bank of New York vaults. Given that the Banca d’Italia stores very little gold at the Bank of England or with the Bank for International Settlements (its two other foreign storage locations), then Italy would appear to have over 1,000 tonnes of gold stored in New York. In November 2014, the Dutch central bank, De Nederlandsche Bank (DNB) announced that it had repatriated approximtely 122 tonnes of its gold from the New York Fed. This would leave the DNB with approximately 190 tonnes of gold still lead in New York. Other central bank gold customers of the New York Fed include the following. The Swedish Riksbank holds 13.2 tonnes of gold (10.7% of its 125.7 gold reserves) at the Federal Reserve Bank of New York. The Central Bank of Finland holds 8.8 tonnes of its gold reserves (18% of its 49,5 tonnes total) with the New York Fed. Other gold account customers of the FRBNY include the Bank of Greece, the Bank for International Settlements (BIS), the European Central Bank (ECB), Banque du Liban (Lebanon), Central Bank of Afghanistan, and the Bank of Ghana. Umlike all other large central bank gold vaults, the New York Fed actually organises daily guided tours of the main gold vault that are open to the public. These tours, which include the New York Fed museum, need to be reserved in advance and are sometimes full-booked up for a few months ahead. The tour does not include the auxiliary vault, and in fact the auxiliary vault is not even mentioned on the gold vault tour, which is another example of how the New York Fed appears to want to downplay the existence of the auxiliary vault.